High quality data breeds higher quality data, as a drone starts with a detailed map of an underwater canyon and collects a more detailed map with video and photos. I have written a few times about the use of underwater drones to map and even protect the marine environment. For instance, an Australian project is using drones to protect the coral reef, whilst an Estonian team are using an underwater device to trawl through shipwrecks. A team of scientists from the National Oceanography Centre (NOC) in Southampton have developed a fleet of robotic submarines to map the cold-water coral reefs found in the seas off the coast of southwest England. The data from this fleet will then inform the management of a new Marine Conservation Zone (MCZ) that will try and protect the coral habitat. The machine is collecting 3D maps of the sea floor together with high-quality video and photos of what it encounters. It will also pinpoint the exact location of the corals, and their health. “The vibrant cold-water coral reefs and associated fauna in The Canyons MCZ provide a rare example of relatively pristine seafloor habitat within English waters. They are the marine equivalent of our ancient oak woodlands, and just as that precious habitat is protected in sites such as the New Forest National Park, this MCZ will help to preserve this marine biodiversity hotspot and minimise the impacts of current and future human pressures,” the researchers say. 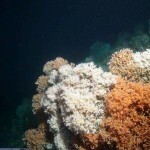 The Canyons MCZ area is particularly difficult to monitor as much of it is over a mile deep and situated within a deep-sea canyon, but the initial results are very promising. The team have been able to create very detailed maps of the site, with unique information on the shape of the canyon. With this data, the device was then ‘flown’ into the canyon to explore the coral habitats within it. The device was capable of collecting a huge amount of top-notch data in a three day period, providing a rich demonstration of the potential of the machine for similar operations in future. Not only is it a cheaper option than expensive ship based operations, it also affords a greater level of flexibility, thus enabling researchers to observe areas such as canyons that would be traditionally out of reach. “The Canyons MCZ is a challenging site for us to survey, as it is in deep water far from land and has a complex and rugged landscape. The equipment and expertise provided by the NOC enabled us to gather high-quality data from this important site in a cost-effective way. These data are providing us with robust evidence about the location and extent of designated features such as cold-water coral habitats, which will enable us to make informed decisions about future site management,” the researchers say.